This particular DVD collection is quite representative of the type of movies usually lampooned by Mystery Science Theater 3000. First there is Godzilla vs. Megalon, a Japanese stuntman in a rubber suit affair which is actually pretty funny in its own so-bad-it's-good way. Then there's the 1950s Roger Corman B-flick, Swamp Diamonds, which merely serves as an excuse to get the rather unattractive female cast to waltz around in their denim shorts, something considered quite risqué? for its time. Teen-age Strangler and The Giant Spider Invasion round off the collection. Teen-age Strangler is a typical early ?Sixties teenage/slasher movie while the largely unpleasant Giant Spider Invasion is a cheap ?Seventies horror flick with an god-awful synth soundtrack. You wouldn't have thought it, but all the movies are in color. THE DISCS: As is usual for this series on DVD, there isn't much in the line of extras. Just a selection of song sequences from the series, some outtakes and a photo gallery. WORTH IT? 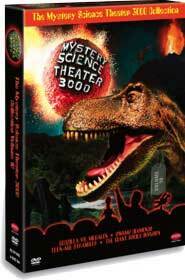 While the movies featured in this collection box set are typical of the sort of movies usually lambasted by MST3K, the episodes themselves aren't as funny as the show sometimes got and therefore isn't really recommended for anyone new to the show. RECOMMENDATION: Newbies would be better off checking out some of the single disc sets containing Eegah and Manos ? the Hand of Fate.) Long-time fans would probably have picked it up by now.